The familiar "bzzzzzzz...thud!" 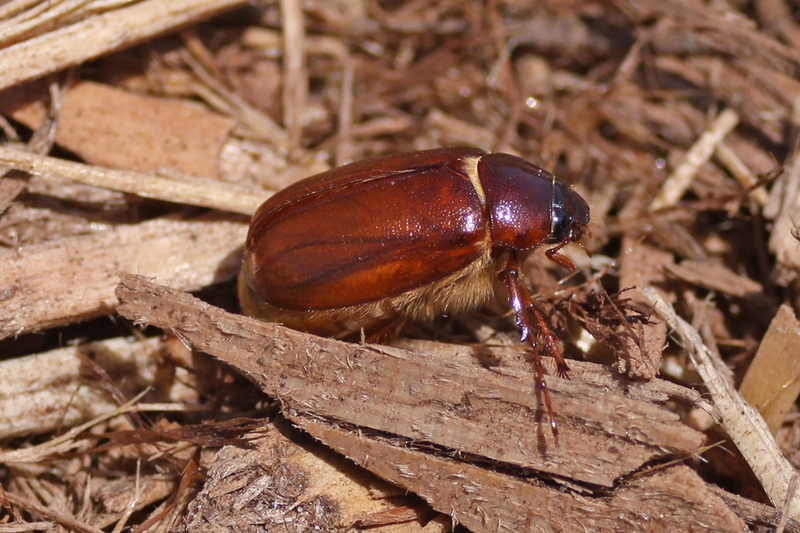 sound made by May/June Beetles as they fly around porch lights at night and bounce off walls, doors, windows, startled homeowners, etc., is now being heard in southwest Ohio. There are five species of beetles in the genus Phyllophaga in Ohio that share the general common name of May or June Beetles. The 1/2 - 1" long adults are slightly oblong, and reddish-brown to black in color. Their obnoxious evening behavior often causes them to be dismissed as nuisance pests. In most cases, this is true. Although adults of most of these species feed at night on flowers, or on tree and shrub foliage, they seldom cause significant damage. However, large numbers of these beetles occasionally produce noticeable leaf damage, and their nocturnal life-style makes them a deceptive defoliator. In 2000 and again in 2011, conspicuous defoliation of oaks and maples caused by these beetles was reported in Ohio and Kentucky. In a few cases, heavy damage literally occurred overnight. The defoliation involved the removal of all of the leaf tissue with the exception of the main veins. Since the beetles are night feeders, casual observers were left in the dark trying to explain the damage. Although damage may appear severe, the beetles only fly for a few weeks, leaving plenty of time for defoliated trees to produce new leaves. Larvae of these beetles are white grubs with feeding habits similar to Japanese beetle (Popillia japonica) and Masked Chafer (Cyclocephala spp.) grubs; however, May/June beetle grubs prefer pasture grasses. Hence, damage to trees most often occurs near pastures. Likewise, significant May/June beetle grub populations are seldom found beneath older lawns, but are sometimes observed where new homes occupy ground which was recently in pasture. Larvae require anywhere from 1 to 5 years to complete their development, depending upon the species.